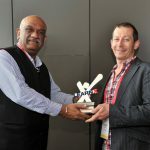 AlertForce has successfully participated in the LearnX -Learning and Technology Impacts Awards . LearnX is a non-profit organisation highlights the progress of learning and supporting technologies. The August 30th conference in Mebourne will include various professionals throughout the corporate, education, and private sectors. More specifically, the conference targets learning professionals who operate and manage e-training solutions and services. Alertforce has proudly accepted the 2nd place awards for Best Learning program- Environmental, and Occupational Health and Safety training programs. Each participant was evaluated according to areas such as: Best Talent, Best Learning Program, Best New Initiative, and Best eLearning design. Within these categories, AlertForce was honoured in the Occupational Health and Safety in partnership with client Port Stephens Council, Environmental in partnership with Carbon Training International, and Compliance (finalist) with client Daly International. AlertForce has continuously excelled and innovated in a variety of areas relating to quality occupational training, and these awards only further support that notion.